For bareboats, flotilla sailing and crewed charters, there are four very common and popular yacht types: Jeanneau Sun Odyssey, Bavaria, Ocean Star and Beneteau Oceanis. The Oceanis and Jeanneau yacht types excel in sailing performance whereas the Bavaria and Ocean Star yachts only focus on comfort which makes the latter two heavier of course. Note that the Ocean Star range only offers larger sizes, larger than 48 feet/15 metres. Besides these four typical charter yachts there are GibSea and First boats available which are also very good. The larger and luxurious gulets are often one-off, with lots of differences between the ships. The typical blue cruises on these gulets or motorsailers take place in the Aegean sea and along the Ionian, Carian and Lycian coasts of Turkey. Most gulet companies are situated in Bodrum. Gulets cannot be rent as bareboats. 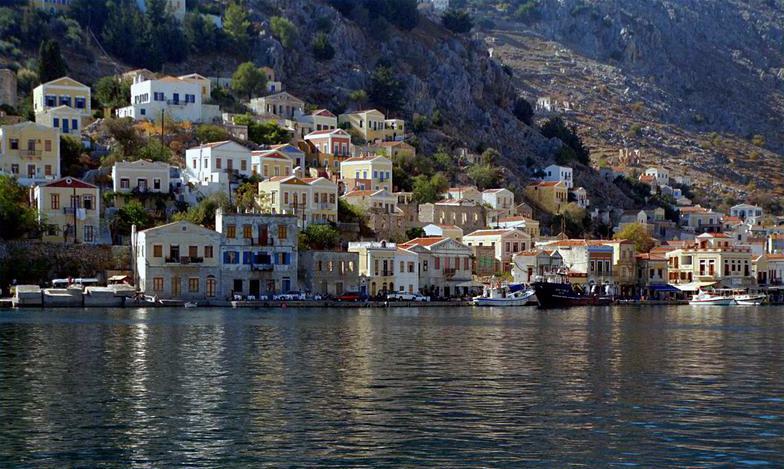 The photo shows Symi port on Symi island in the Dodecanese.
.: Back to the charter yachts :.